The old saying that says “it’s not the years it’s the mileage” is definitely true for this rare 1967 Shelby GT500 beauty. In the Raiders of the Lost Ark film, Indiana Jones has a great line when he says, “it’s not the years it’s the mileage.” This is definitely true when it comes to classic cars and very true for the rarest 1967 Shelby GT500 on the planet. Barrett-Jackson has announced they will be auctioning off the rare car at the companies flagship Scottsdale auction, taking place January 13-20, 2013 at WestWorld of Scottsdale. The image shown is the actual car that will go up for auction next month. According to Mustangs Daily, the super rare '67 Shelby GT500 (Lot 5024) will go across the auction block with no reserve. The classic muscle car only has 9,841 original miles on the odometer and could be the lowest mileage '67 GT500 on the planet. MD says the car is owned by Shelby Mustang collector, Stephen Becker, president and CEO of Planet Cobra. Becker specializes in 1965–1970 Shelby Mustangs and offers the cars internationally. Barrett-Jackson will be honoring the late Carroll Shelby and will also be auctioning off nearly 30 Shelby vintage automobiles at “No Reserve.” Carroll Shelby was most instrumental in shaping the high-performance landscape in America and will be honored for his contribution. The 1967 Shelby GT500 was the first to offer a big block Ford powerplant and it changed the muscle car era forever. The rare Nightmist Blue '67 GT500 comes with the original 428 Police Interceptor big block V8 with a dual four-barrel carburetor. The car still has its factory paint, wheels, tires and drive-train. It includes all original documentation including New Jersey license plates and a 1970 inspection sticker. Mustangs Daily says the car has been displayed at the Shelby Headquarters in Las Vegas, and the GT500 went on tour in 2010. It was one of 20 vehicles invited to the Shelby tribute at the Quail in Monterey and appeared at the SAAC convention. 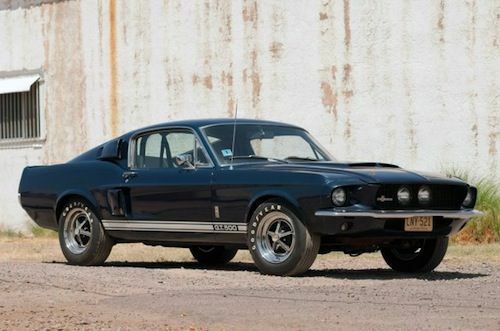 In addition to the low-mileage 1967 GT500, other notable Shelby’s include a stellar 1965 GT350 (lot #5023) previously owned by Ford, a 2012 GT500 50th Anniversary Super Snake (lot #1321) to the rarest Shelby Mustang in existence, “The Green Hornet,” (lot #5022). This could be the most highly anticipated Barrett Jackson auction in history as collectors from all over the world are eagerly waiting for the chance to bid on these legendary vehicles. If you want to bid on these super rare Shelby’s and the 1967 Shelby GT500 with only 9,841 original miles, be ready to bring lots of money because they will likely bring record prices.